Make no mistake, Virginia is a pretty tough climate in which to grow grapes, at least to grow grapes that allow you to make world class wines. True, we can produce wines of that caliber in vintages such as 2007, 2009 and 2010, but in vintages such as 2003 and 2011, forget about it. Those years are more an endeavor of making cleaner wines than wines that can stand along side the very best of California and France. So when great vintages come along and mother nature combines with all the other variables to produce fruit of that quality, the winemaker needs to take full advantage and convert that fruit potential into a fantastic wine. 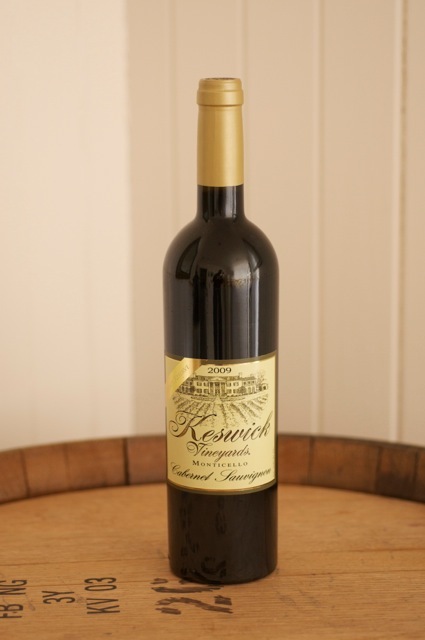 This weekend marks the official release of our 2009 Keswick Vineyards Reserve Cabernet Sauvignon, a wine that I think ranks in our top three ever produced here at the estate. 2009 for me was a fantastic growing season. It was long and temperate and we were able to pick fruit at the optimum ripeness, which meant good sugars, developed flavors in the grapes and, more importantly for Cabernet, ripe tannins. The winemaking protocol was actually pretty simple. We cooled the fruit and sorted after de-stemming to remove any unwanted material including green grapes, jacks, stems and leaves that bypassed the destemmer. The fruit was then transferred to open top stainless steel tanks, warmed up, and allowed to undergo native fermentation without the addition of commercial yeast. BAM we had good wine. The philosophy here at Keswick is to produce wines that reflect the season, the area, and the soil in which it was grown. The French refer to this concept and notion as Terroir. For me it means that what you taste in a glass of wine is a product of nature and not of manipulation by me the winemaker, same thing really. And so it was, after fermentation and pressing, the wine was barreled down to French oak barrels and allowed to mature for 22 months with very little manipulation (other than the occassional taste, purely for quality control purposes of course). Surely, there are a lot more decisions that go into making wine, but if you break it down- what made the 2009 Cabernet a stunner was, truthfully, the fruit quality which ultimately forged this quality wine. I just tried to stay out of the way and not mess it up. So it is truly a joy to be able to release this wine to the public on Saturday. I hope you will like it as much as we do here. It is 100% Cabernet grown right here on the estate. It is definitely New World in style, displaying the typical aromas of plum and cassis backed by ripe integrated tannins (which is a fancy way of saying that although there is oak, it is not too dominant to suppress the fruit). The wine also has a fair bit of acid which really keeps the wine fresh and focused. As far as drinkability, you are good to go- but if you would like to lay it down, I truly think this wine has the stuffing to age for another 8-10 years. It is dark and inky, brooding yet seductive, a wine that we are very proud of. Okay, I have to brag a bit here in order to get some hype. It was one of the wines that was selected to be in the Governors Case, following the Virginia Governors Cup Wine Competition. That meant it was rated amongst the top twelve Virginia wines for that year. It also received a double gold medal at the San Francisco International Wine Competition, the largest and arguably the most influential competition in the States [as taken from their website]. To put into perspective how well this wine did, there were only 5% of the total entries awarded the double gold, and in the Cabernet category (which was the most competitve category in the competition based on the number of entries), bested some Napa Valley wines that retail for $200 a bottle. Okay, competitions are what they are, but this is like me beating Tiger Woods at match play in golf. For an itty bitty Virginia Cabernet to wine this award says something about the quality of the wine and also the quality that Virginia has in producing world class reds. So ladies and gentleman, come by on Saturday to taste what we think is one the best reds we have ever produced in our short wine making history. We're smack in the middle of the 2012 harvest (which I am hoping will produce more high calibur wines! ), so I will be working away in the cellar racking the whites- feel free to come back and let me know what you think of the Cabernet!